Watts RD-250 Replacement Cast Iron Drain Dome, 6-1/2 in. 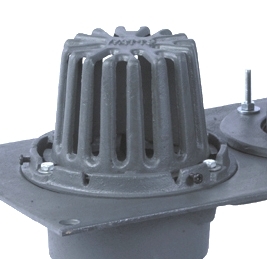 PRODUCT: Watts RD-250 Cast Iron Drain Dome / Strainer. Fits Watts RD-250 / RD25. 6-1/2 diameter X 5 inches high. Price/Each. Watts Drainage Products RD-250 cast iron replacement dome (6-1/2" Dia. X 5" High). Flashing clamp / ring not included. REPLACEMENT FLASHING CLAMP FOR WATTS RD-250 DRAIN (RD25 / #RD-250-FLG). PRICE/EACH. (dome not included).